The Essential Forest-Gardener – what grows in the forest? It strikes me that this is a very interesting time to be a Republican. The questions reflect what Mr. Trump’s advisers described as the president-elect’s coming to grips with the fact that his life is about to change radically. They say that Mr. Trump, who was shocked when he won the election, might spend most of the week in Washington, much like members of Congress, and return to Trump Tower or his golf course in Bedminster, N.J., or his Mar-a-Lago estate in Palm Beach on weekends. Assuming that Trump is a mere figurehead, the Republican establishment is going to have an unfettered field day. The anti-establishment populist as the ultimate establishment enabler. Already his transition team is chock full of lobbyist cronies. The far-right is going to go large, from financial deregulation to Roe v. Wade. The stuff of nightmares. The only fly in the Republican ointment is the nature of the chalice that Trump is handing them. His platform was based on draining the Washington swamp and making life better for workers. When the opposite happens, as it will – what will his base do? Will they accept the baubles of victory without the substance they were promised? Or will they rise up and annihilate the Republican party forever? I doubt that Republicans are thinking about this, as they fight and rush to get their snouts in the trough. They’re going to have a great 4 years. After that, maybe not. “Women anxious that a Trump presidency in the United States could set back or destroy many of their rights are planning a massive march in Washington. The march is planned for January 21, 2017, the day after Trump is to be sworn into office, at Washington, DC’s Lincoln Memorial. the truth is trump is a rep from that party – repugs will try to take the baubles and then shun him if they can – but they underestimate his venal character and that of his close ones. I expect a sort out, a night of long knives – but not yet, not for a while – best to build the complacency with the Party first, build the base outside the Party – have some rallys, tighten up the inner circle – that sort of thing. Last time I checked, 35,000 does not equal 1,000,000. I really feel that Americans are over reacting just a little bit at the moment. Crikey he hasn’t even done anything yet. Personally I’m NOT pro Trump but I am anti Hillary and so very pleased she is not President, am still aghast that Agent Orange is however. But hey all those protests make for a fantastic revenue as citizens tune into news networks across the USA post election, networks whom would have been worried that their viewer ratings would be dropping now the election is over. I strongly recommend watching this weeks episode of The Listening Post, its full of information re the media and trump. “This week on The Listening Post , we take an extended look at the news coverage of the US presidential election. Starting with the on-again-off-again, love-hate relationship that Donald Trump had with the news media, analysing the media’s over-reliance on the polls and looking at the abyss between the Washington press corps and the people to whom they were reporting. We also ask how the news media will deal with a president who calls them corrupt. I’m with you Cinny…. just glad to see the end (I hope) of the Clinton dynasty. The Democrats are not what they claim to be, and as to what Trump is going to do we should wait and see instead of making up crap. My main fear about him is his chance of surviving the next few months, and if he gets eliminated…..? Interesting times. Turns out that many of the anti Agent Orange demonstrations over the last couple of days were organised by a group created by one of Hillarys largest donors. Billionaire globalist financier George Soros’ MoveOn.org is the driving force behind the organizing of nationwide protests against the election of Donald Trump. Lolz i wonder if he has any media interests and wants to continue the show/revenue? ‘Many’? RT uses the word ‘some’, but in a quick scan through doesn’t quantify that. MoveOn.org, a liberal group, had called on people to gather in cities nationwide. Ben Wikler, MoveOn’s Washington director, said that people had registered to organize events in 275 cities and communities across the country, noting that many were candlelight vigils and group discussions rather than the sprawling marches seen in New York and Chicago. Just because some people want a post-truth world, doesn’t mean we have to oblige. Ironic when one considers the song and dance made by Obama and the Clinton camp about the Donald not accepting the people’s choice. It would be surprising – not Soros’s style at all. His style is more organising reprinting of Popper’s “The Open Society and Its Enemies” – apparently this makes him an existential threat to Putin. I’m thinking your focus is to narrow Anthony. You ask – When the opposite happens, as it will – what will his base do? Will they accept the baubles of victory without the substance they were promised? Or will they rise up and annihilate the Republican party forever? That assumes the vote for Trump was affirmation rather than protest. Like BREXIT and like the Scottish referendum, the rise of the SNP, the ‘death’ of Scottish Labour, the rise of Corbyn…I could go on….people are voting against the establishment of these past 40 years; against liberalism; against an increasingly unbearable status quo. So when people get agitated over Trump’s failure to deliver on his promise to ‘make America great again’, it won’t merely be the Republican party in the cross hairs. It will be anything and everything that is seen as promoting, defending or hankering for a return to “things as they were”. The Republican base, the Democratic base and everything associated with them policy wise, prescription wise or analysis wise is going to be rendered burger. So when they don’t get the change that they are hoping for, what is next? The gun? Yes. Just like at Standing Rock: they’ll be shot by heavily armed Police. So when people get agitated over Trump’s failure to deliver on his promise to ‘make America great again’, it won’t merely be the Republican party in the cross hairs. A white working class vote for Trump in Michigan or Wisconsin is ***already*** a vote against the Republican establishment. Forget about what they were against. It’s immaterial. What we are watching is what they are for. No it’s not. The man is appointing the entire establishment to his cabinet, just look at his list of potential nominees. He’s been quite clear since appointing Pence that he won’t be setting the establishment on fire to achieve his goals, even if his stated goals were very anti-establishment, I’d be surprised if he achieves even half of the ones the Republicans don’t already secretly want. A few people around these parts have enjoyed accusing Trump of being a tyrannical demagogue proto-Hitler dictator in the making. Oddly enough though, the US remains a consitutional democracy and yes he is going to have to work through the House and Senate and the Washington DC machinery, and yes, he is not going to get his way on that many things. He’s already conducted a successful political revolution against both the establishment Democrat and Republican status quo, neither of whom, nor all their DC machine allies, wanted him. The rest is going to take a bit of time. (And he’s not the President yet). He’s succeeded as an anti-establishment Republican, however he has a very establishment Republican congress to work with, so it’s more like he struck a blow against them than that he full-on defeated establishment politics, that’s a much longer process than one election cycle would allow for. Whether the Democratic status quo is actually defeated depends as much on what happens with the new progressive wing of that party as it does on Donald’s potential re-election in 4 years. The Hillary supporters are already making noises that suggest they think that their establishment policies were somehow fundamentally sound, which I think both of us would agree is absolute rubbish and clearly the reason why the race was close enough for Donald to “steal” a win using the electoral college. 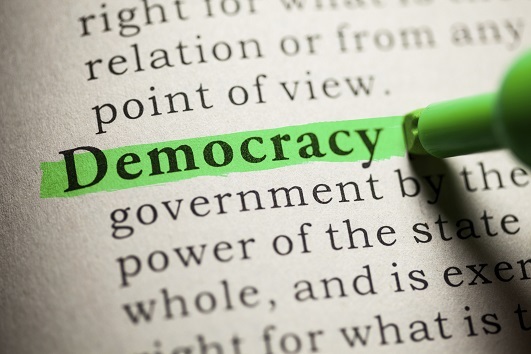 The US, functionally, is not a democracy and hasn’t been for decades. It is an oligarchy that holds elections, and while it’s not guaranteed that every winner is an oligarch, it’s guaranteed that enough of them will be to ensure continuation of oligarchical government..
That assumes the vote for Trump was affirmation rather than protest. I think it was both, but that’s certainly an interesting angle. well I think it is too soon and not enough information to state that “trump will be a figurehead” rather than president. A discussion based on that premise is just speculative now. Trouble with that Bill is that there will be no way to measure it. In four years time Trump can say that the US is better now and will be even better in the next 4 years. Like National’s slogan it might mean different things to different people and is unprovable. I think Bill’s central point is that a vote for Trump was a vote against the establishment. If Trump proves to be an establishment figure with the right sales pitch for the time, his supporters will be mightily pissed off, but they will not then look hopefully toward the Democrats. If that happened, Trump would be seen as “just another cog in a corrupt machine” that includes the Democrats. This observation was made in an article in The Atlantic: “The press takes him literally, but not seriously; his supporters take him seriously, but not literally.” http://www.theatlantic.com/politics/archive/2016/09/trump-makes-his-case-in-pittsburgh/501335/ Whether or not he “makes America great again” will be less important to his supporters than whether or not his actions in office show that he has their backs. Also remember that Wisconsin and Michigan both voted for Bernie Sanders in the primaries, ahead of Hillary Clinton. That was a big warning from those rustbelt states to the Democratic establishment. Yes, they seemed to assume far more political capital than they actually had. Firstly there was the idea that blue collar workers can be safely ignored since they have nowhere else to go – if they are let down for long enough and badly enough they find somewhere else to go. Then there was the idea that once Hillary got the nomination, Bernie’s supporters would fall into line, as Bernie was obliged to do in exchange for running as a Democrat. That didn’t work out either. The lesson for the Democrats seems to be this: back in the 70’s you stood opposed to a conservative establishment, personified by people like Richard Nixon. Now the establishment is you, not some impoverished blue collar man, permanently at risk of destitution or prison, who appears to occupy roughly the same spot in your political/social map that Nixon once did. Bernie understands this but I am not sure how many more of them do. I think Pence will be president before the term’s up. Trump doesn’t know how to be the president. And that’s why Pence took the job in the first place, too. I’d say if Trump doesn’t keep his promises and they start the TPP type agreements again that was his point of difference to voters – there will be civil unrest. There was already civil unrest with Obama but the people were black, now they are white and if they start uniting – it’s civil war or a revolution in the US. American’s have been told they live in the best country on earth, the opportunities are theirs, but after the GFC many people who believed this, found they lost everything, job, house, dignity and identity. The are middle class. The working class had already lost everything under NASDA. So now the middle and working class are going to fight to get back what they have been told since the womb, America is Great and by extension they are deserving of a decent standard of living, not long hours, lower wages, pollution and insecure jobs that neoliberalism has given then. The white working class has been voting for the Republicans and being shafted by them since Ronald Reagan because their prejudices are more important to them than anything else. They will take being shafted by Trump meekly as always. The middle class are less weak and less meek than the working class. The Clinton types are already rioting. The police/establishment may feel ok to fire on blacks and get away with it, but educated whites? We could take Trump at his word and start applying high tariffs to any goods we import from the USA ( selectively to suit us of course, ) Modify our holiday visa rules to let in those he sees as threats and put the rest of the hard right republicans through a serious interview of many hours at the airport. If he wants isolation for the US perhaps we could get in first? Discriminate heavily against white rich middle aged males but not anyone else of course. If he wants to discriminate let’s go there first? And the same for the rest of his planks we don’t like. But seriously there is the matter of him or the other Republicans causing a huge depression – what can we do locally to insulate our economy from this – and which other countries would like to join us? Did you notice the Dow Jones hitting all time highs this week? Do you think that Trump’s trillion dollar infrastructure spending plan is going to be bad for the US economy and bad for jobs? With a small government republican senate? That wall will never be built or much else . Anyway my main point is how unpredictable all this is so our best bet might be to get as far away from Dodge as possible – it might be best for our health. I’m with you on that and another reason why I live in little ol’ Dunedin. Trump will learn to operate the executive controls, and he’ll have a great time. The US will get what it said on the tin. Trump will make plenty of mistakes at first. But compare his campaign and his first speeches on the Primary trail compared to his campaign and his last speeches in November. The man learns, and he learns fast. The second half of his first term is when Trump will really hit his stride. His choice of Kellyanne Conway as his campaign manager was a masterstoke. Conway broke one glass ceiling: first female nationwide campaign manager to successfully bring home a Presidential campaign. Trump’s not a misogynist. But he is extremely prejudiced towards character, loyalty and talent. The one to watch is the Pence-McConnell relationship. A fully Republican government will install the Republican policy wish list. The time for unity won’t come again for a while. One conspiracy theory I read this morning is that at some stage Trump will be impeached. I’d actually consider it a real possibility that the House will vote for his impeachment, not simply as a vehicle for Pence, but because a lot of the things Trump has stated he wants to do are potentially impeachable. It’s just a matter of whether enough Republicans would vote for it. I would consider it very unlikely, however, that the Senate would vote to convict him, as you need 67 votes, and I can’t see 40+ Republican senators splitting from Trump unless he lights a Republican donor on fire in front of cameras. One conspiracy theory I read this morning is that at some stage Trump will be impeached. I am sure he will give them plenty or reasons to do this. Then Pence can take over. That’s the House of Cards (Spacey) script. Nor does Ryan or McConnell to achieve their policy ends. They can go back to the policy writers at Exxon, Aetna Life, McConnell Douglas, Liberty University, Heritage USA, and Breitbart to continue writing the policy agenda. And then just get it enacted. They have full majorities across Senate, Congress, White House, and shortly Supreme Court. That’s written on the tin. I’m looking forward to Trump’s first State of the Union to actually see the policy programme. Then we will see the truth of how united the Republicans are across the levels of House and White House. You have to ask what would happen to Republican congressmen and senators at the mid terms if they tried to impeach Trump. They would be decimated by the popular vote. Depending on whether the Democrats get taken over by the new progressive wing of their party or not, if they do, the Republicans are in for a blood bath in the midterms anyway, at which point some might go for it. The real issue is finding the supermajority in the Senate, which I’d consider an outside chance at best. You think he’ll last that long? There’s a legal case or two confronting him over the next little while – the outcome of which might see him deemed unfit to continue as president. Time will tell. A sitting President is immune from federal prosecution. Only at the house’s discretion, he’s certainly not above the law just because he’s President, and if a majority want him out, he’s gone. That should be; if a supermajority “want him out, he’s gone”. A simple majority won’t do it, nor fortunately can Trump amend the constitution without votes from the Democrat side. Unfortunately, he can declare war with a bare majority of congress. Richard Nixon stepped down a matter of hours before he was going to be impeached. History has a habit of eventually repeating itself. Joe’s technically correct about initiating an impeachment hearing and how it works for the House. It’s the Senate that needs the supermajority to actually convict him and chuck him out. That’s never actually happened yet in US history. Anne is probably correct that if it looks likely his party will turn on him and vote for impeachment that he’ll probably just resign. And if we want to stop similar issues here then don’t create large classes of people who are being shut out who in a state that is getting richer they are holding or becoming poorer. Trump is completely inexperienced and is already backtracking at a 100 miles an hour on a lot of rhetoric. He’ll be easy meat for GOP hard right Koch agenda. Expect Kansas comes to the Federal government. What people seem to not have particularly noticed is the Republicans currently control all three arms of the government, and will retain that control for at least two years. Expect them to absolutely ram that advantage home. More voter suppression. More Gerrymanders. More laws designed to entrench corporate power. By the time the GOP are finished when the next presidential election rolls around, one white rural vote will be worth four or five Black or Hispanic votes – that is assuming if after the green light to new Jim Crow laws there will be any Blacks left qualified to vote. Now, an America like that will be a powder keg, a Black insurrection would not be out of the bounds of possibility. The whites who elected Trump will feel betrayed – they will possibly go to neo-Nazi organisations, especially if racial tensions explode. All in all, this election is a disaster, because it has put in charge those who wish to create a reactionary revolution that seeks to deny the reality of modern America and the modern world. That’s what happens when you install someone completely unqualified. Imo, this is the real life conspiracy. Coney didn’t decide to re-visit the alleged Clinton emails scandal one week out from the election without some powerful behind the scenes backing. Anyone who believes he did is living in cloud cuckoo land. And it worked a treat didn’t it! Will the Democrats take legal action against the FBI chief and the Republican backers who were enabling him? I damm well hope so. Rule #6: Remember the future… That should not be normal. But resistance—stubborn, uncompromising, outraged—should be. Some of these rules may seem counter-intuitive (especially #4 &5, which seem like advice to paint a target on your forehead), but Gessen goes into more detail in her article. The rules are intended not just; “for surviving in an autocracy”, but also; “salvaging your sanity and self-respect”. A case of deja vu about to rear its ugly head? A disturbing common factor amongst demagogues/dictators/despots it seems! They do victory tours, too. NEW YORK (AP) — Donald Trump may take a victory tour to states that elected him president, an aide said Saturday, as boisterous protests unfolded outside the tower where he holed up with members of his transition team and fielded calls congratulating him.